How often does thyroidectomy result in surgical errors or unwanted outcomes? The answer is much more often than reported. The reported surgical error rate for papillary thyroid cancer is 2 – 3%, however, research reveals errors are nearly six-times that number. Meanwhile, error rate for medullary thyroid cancer is nearly 26%. Unfortunately, there is no legislation that requires accurate reporting of surgical errors, therefore, we cannot know the exact rate. What we know is, thyroid cancer surgery is not as safe as previously reported. And the consequences can be dire. For the sake of this article, there is a difference between unwanted outcomes and botched surgeries. The difference lies in which unwanted outcomes can be avoided based on the surgeon's skill. For example, if the laryngeal nerve is severed during thyroid surgery, an unwanted outcome can be avoided by repairing it. But, repair only happens if the surgeon is prepared, trained, and has the right tools available. Therefore, if the surgeon does not repair the nerve due to lack of skill or training, then it is botched surgery. An alarming statistic, 90% of thyroidectomies performed in the United States are done by surgeons performing fewer than ten surgeries annually. What are the surgical errors resulting from thyroid surgery and are they avoidable? Below, a description of the unwanted outcomes, in laymen terms. The language is intended to be simple and easy for the patient to understand. A study about the risks of thyroid surgery, by Dr. Megan Haymart and Dr. Maria Papaleontiou, reveals surgical errors are nearly five times what is reported. Their research lists thyroid surgery errors as vocal cord paralysis, calcium impairment, and bleeding. These errors effect the patient for life. 1. Vocal cord paralysis: it occurs when the Recurrent Laryngeal Nerve is Injured (RLNI). If the nerve is damaged during surgery, it can be immediately repaired if the surgeon is skilled and prepared. If a damaged RLN is not repaired, it results in lifelong problems for the patient related to swallowing, breathing, and speaking. 2. Parathyroid impairment: This happens when a surgeon injures the parathyroid glands; known as hypoparathyroidism. The result, lifelong symptoms that include tingling in the lips, fingers, and toes; dry hair, brittle nails, and dry, coarse skin; muscle cramps and pain in the face, hands, legs, and feet; cataracts; dental problems; memory loss, headaches, and muscle spasms. And, lifelong dependency on calcium carbonate and vitamin D supplements. 3. Bleeding: called neck hematoma, it represents a major concern for surgeons because it can result in severe and even life-threatening complications. In fact, postoperative hemorrhage may result in airway compression and respiratory distress. Bleeding during thyroidectomy puts the RLN and the parathyroid glands at significant risk of injury. Risks of thyroid surgery are much greater than the above three surgical errors. If the surgeon is skilled, risks are mitigated. Fortunately, there are a number of highly skilled thyroid surgeons. But, if the surgeon is not skilled, errors and botched surgery spike significantly. 1. Residual cancer: with advancements in technology and ultrasound, this should never occur. But, a less skilled surgeon will sometimes leave malignant lymph nodes behind. This will leave the door open for more surgery. 2. Shoulder impairment: very little research and data exists regarding shoulder pain due to thyroidectomy, however, it occurs often and is very painful. On average, 10.2 years after surgery, DTC (differentiated thyroid carcinoma) patients reported a 58.7% prevalence of shoulder pain, which was significantly more than the 13.8% reported by healthy controls. 3. Problems swallowing: under-reported in medical journals, but a prevalent problem related to thryoidectomy is acid reflux and aspiration, or problems swallowing. 4. Breathing problems: this will most often occur when there is damage to the recurrent laryngeal nerve (RLN) which results in paralysis of the vocal cord. The RLN is important for vocalization, breathing and swallowing. Damage to the RLN will result in shortness of breath. 5. Quality of life (QoL) downgrade: University of Chicago Medicine researchers Briseis Aschebrook-Kilfoy, PhD and Raymon Grogan, MD, say "Often times, family members don’t take thyroid cancer treatment seriously. Society, healthcare professionals, and the media have minimized thyroid cancer, and in return it has made patients feel minimized and alienated." 6. Financial strain: Dr. Jonas de Souza's research finds a high rate of financial strain for thyroid cancer patients, including bankruptcy. The rate of financial strain is disproportionately high for thyroid cancer patients compared to other cancers. 7. Brain fog: mental health is impacted by thyroidectomy. 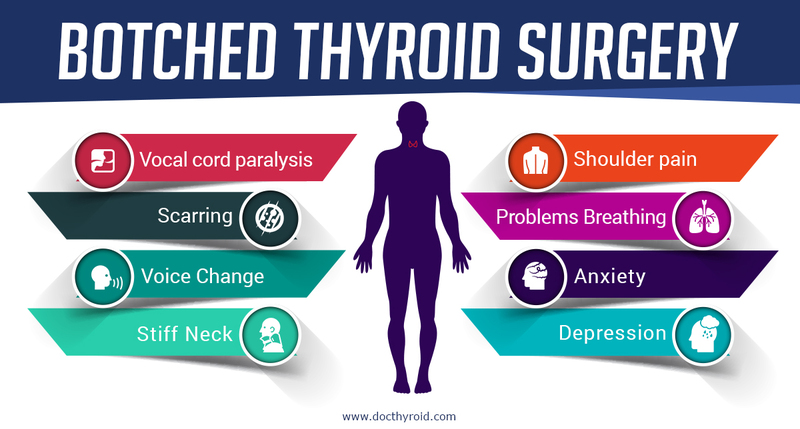 Research is lacking, however, almost all thyroidectomy patients complain of mental impairment including panic attacks, brain fog, forgetfulness, anxiety, lack of motivation, and difficulty concentrating. Meanwhile, these complaints are discounted by many physicians, further alienating and minimizing the patient. 8. Stiff, tight neck: not enough attention is given to the need for neck exercises immediately following thyroidectomy. In Japan, neck exercises are encouraged within 24 hours post surgery. Patients who do so report less stiffness and tightness in years to come. 9. Weight gain: studies recognize weight gain in thyroidectomy patients, however, the number of patients complaining of this condition is not accurately represented in research. Meaning, the complaint is often discounted by physicians, including endocrinologists. Many doctors blame the weight gain on diet or menopause. Patients should be told in advance, if a thyroidectomy is performed, it will result in weight gain more often than not. 10. Osteoporosis: research confirms a direct correlation between TSH suppression and osteoporosis. 1. Scarring: unavoidable. Every patient will have a scar, the severity will depend on genes, skin type, and skill of surgeon. 2. Levothyroxine: after total thyroidectomy, patients will be dependent on levothyroxine for life. Side effects of include fever, hot flashes, sensitivity to heat, sweating, headache, nervousness, irritability, nausea, sleep problems (insomnia), changes in appetite or changes in weight, changes in menstrual periods, hair loss, and osteoporosis. 3. RAI: or, radioactive iodine. Regardless of revised guidelines recommending against broad use of RAI, it is overused; some patients are receiving the treatment without necessity. Doctor Thyroid is listened to in over 40 countries, with as many as 20,000 downloads per episode. The audience includes patients, doctors, and researchers. Additional information about Doctor Thyroid and past interviews maybe accessed on iTunes (http://bit.ly/iTunes-Doc-Thyroid).